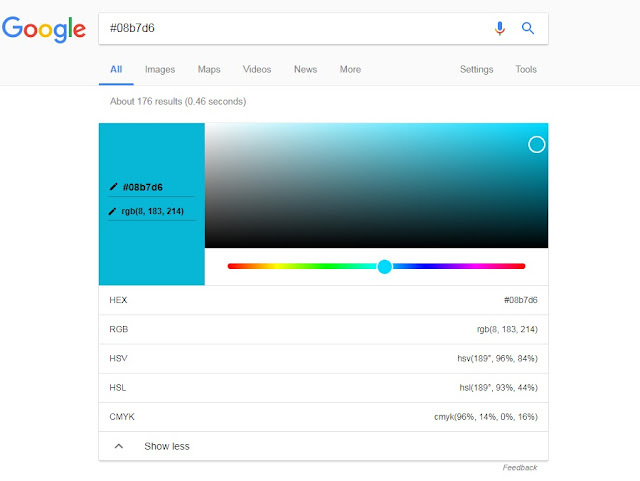 Whether you're looking for a new color or just want to check out what a RGB color code is, Google can help. If you ever toyed around with an image editor or web design, you'll most certainly came across some sort of RGB color code. For computers, there's no such thing as "yellow" or "blue"; all colors come down to some lever of its Red, Green, and Blue color components. That's why you'll often see things like RGB (100, 200, 255) or, in a shorter notation #3344DD (an hexadecimal number for each R, G, B, component). Well, you can simply search for one search code on Google to a nice color widget that not only allows you to check the color, but to messe around with any other color and find its code. More so, you not only get the decimal and heaxadecimal color representation, but you can also see it in other colorspaces, like HSV, HSL and CMYK. If you need to check some colors in a pinch and have no image editor around... just google it!